Although Wilhelm and Holgar Moller, two Danish-born brothers had experimented with the building of a lightweight car in their native country, they didn't try to put their cycle-car into production until the relocated to the United States, ten year later. The brother's tiny European-style $1,000 roadster debuted at the New York Automobile Show in January of 1921 where it was well-received. Unfortunately by the time the car entered into series production, the price had escalated to $1,500, which was roughly three times as much as Ford's Model T. Consequently few buyers were found, although the Mollers claimed they exported a large number of vehicles to Europe, where cycle cars were far more popular. A redesigned version of the car, which was named the Falcon, debuted later that year, but series production is doubted. "The light car is today a well-recognized type and, in the last two years, has undergone changes so important and remarkable that its popularity has grown immensely. "Exhaustive study and experiment have developed the fact that from the standpoint of ease of control, comfort, quietness and refinement of action, the light car greatly increases the pleasure of driving. "The economy in operation obtained from low fuel and oil consumption, low initial cost and greatly increased mileage in tires is a most desirable feature in the "MOLLER CAR" and should appeal to all motor car owners. "Considered from the standpoint of luxurious smoothness of motion the success of Mr. Wilhelm Moller, designer of the MOLLER CAR who has given the subject constant and thorough study since 1911, is most remarkable. Mr. Moller is one of the pioneers in the particular field in which the object is to obtain high power economically from small cylinders. "In achieving this success, Mr. Moller has not neglected the study and improvement of many other aspects of the light car. The result is the "MOLLER CAR" a vehicle standing in a class apart, capable of attaining and maintaining really high speed, and in which the springing and balance on the road are perfect at all speeds. Spence and flexibility, quality hitherto conspicuous by their absence in high efficiency engines, have received great attention, and are possessed in a very marked degree by "The MOLLER CAR". "The car was not put into production by the Moller Motor Company until two years of experimental work and hard running on the road had led to the discovery and elimination of all undesirable features." "MOLLER MOTOR CO., formerly located in Lewistown, (Pa), now operating in Hagerstown, Md., was organized in November 1919 under a Delaware Charter with a capitalization of 50,000 shares of Common Stock of $10 par value per share. Up to its present stage only 7000 shares were sold years ago to the public. For which the Treasury of the Moller Motor Company received $35,000. This money was used to buy machinery, material and the first chassis were completed. "The local banks around Lewistown financed the Moller Motor Co. on the merits of their proposition to the amount of over $30,000. With this addition of capital, the Moller Motor Co. completed their chassis which sent the same to New York and from there to the foreign countries. During, and after the war, on account of the foreign exchange, It became necessary to discontinue the sale of chassis to the foreign countries, and it was decided upon by the Moller Motor Co. to have on the market the completed car. "This decision necessitated an expansion, larger factory buildings, and the space occupied by the Moller Motor Co. in Lewistown was not sufficient to take care of this expansion. The Industrial Service & Sales Corp. of Hagerstown, owners of the old Eldridge Bros. farm now known as the Virginia Ave. addition, induced the Moller Motor Co. to locate in Hagerstown. "An agreement was entered into between the two corporations, in which the Moller Motor Co. agreed to move to Hagerstown if all debts, notes and obligations of the Moller Motor Co. were, paid so that they could begin business in Hagerstown with out any debts whatsoever. This agreement was carried through and at the present time, the Moller Motor Co. has no debts whatsoever, and its assets such as machinery, completed chassis, completed motors, and parts as well as the pattern and patents are free from all debts. "The Moller Motor Co. selected a plot of ground 200' x 900' along the Pa. R.R. on the main line from Hagerstown to Baltimore, same plot being part of the old Eldridge Bros. farm. The first factory unit 100' x 200' was started, and at the present time, the foundation and piers are finished and ready for the first floor-joist and for the first story to go up. 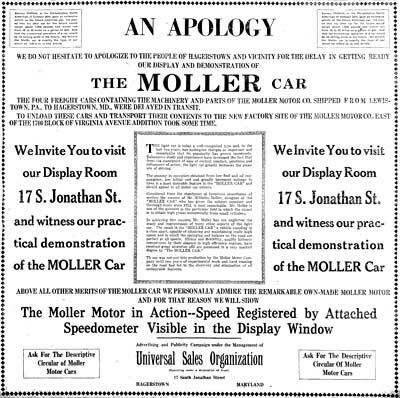 "To demonstrate the merits of the Moller Motor Car, a display room was opened at 17 S. Jonathan St. and for the last three weeks a thorough demonstration was given. This demonstration is under the management of the Universal Sales Organization. "The Moller Motor Co. has decided to allot a small amount of stock for Hagerstown and vicinity, which can be purchased at their display room, 17 S. Jonathan St., Hagerstown, Md. "It is the Intention of the Moller Motor Co. to rush the erection of the factory, installation of the machinery, and if some support is given by the people of Hagerstown and vicinity; the Moller Bros. are positive that they will be in operation not later than 3 months from date. All of the machinery and belongings of the Moller Motor Co. are now on the ground and as soon as the water for which the company is drilling now has been secured the completion of the factory Unit No. 1 will be hastened. "The Moller Motor Co. expects to make their own bodies, and for that purpose the next building to be erected will be a body and paint shop. Several chassis, are now at the Hasting Body Works in Philadelphia and according to the telegram received last week, these cars will be finished by the end of next week, and the actually completed Moller Car will be running in Hagerstown not later than two weeks from today. "Eight thousand shares of the Moller Motor-stock has been set aside to be sold in Hagerstown and vicinity, at $10 per share. Subscription blanks are at our display room. The eight thousand shares must be subscribed for by June 25th, 1923, and with the interest manifested by Hagerstown people in our display room and during our demonstration, there is no doubt that this allotment will be over subscribed. "Universal Sales Organization, 17 South Jonathan Street, HAGERSTOWN, MD"
Although there's no evidence to suggest that the Moller Bros. ever got their second series of cycle cars into production, Holger Moller's son states that his father's firm made a small number of bodies for other manufacturers after moving to Hagerstown. 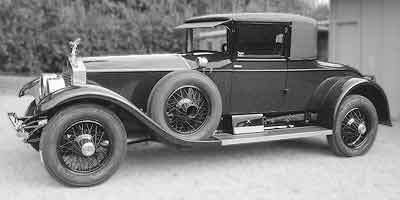 The statement was made by Holger Moller Jr. to Willard J. Prentice while Prentice was doing research for an article about Maryland-built automobiles for the Antique Automobile. The finished article appeared in the November-December 1979 issue. pp 19-33. News of the Moller Brothers activities vanished from the local papers soon after the June 14, 1923 prospectus was published. An unrelated Danish-born Moller, Mathias P., soon announced the manufacture of another Hagerstown-built automobile, the Dagmar. M.P. Moller, the famous Hagerstown organ builder, had recently become the sole owner of the Crawford Automobile Co. and decided to produce an automobile of his own design. The Dagmar was initially advertised as a high-end Crawford, but Moller decided to reorganize the firm as the M.P. Moller Motor Car Co. Production of the Dagmar commenced in 1924 and continued on a very limited basis into 1925. The story of the M.P. Moller Motor Car Co. and its various body-building activities is told on the M.P. Moller page.